Hamon Transfer Standards | Ohm-Labs, Inc. Built according to Leeds & Northrup's commercialization of B.V. Hamon's design, Ohm-Labs offers the 4321 and 4323 Hamon Transfer Standards. 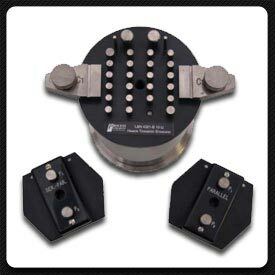 This pair of standards allows accurate transfer from the 1 Ω to the 10 kΩ level. The same construction can be supplied as a model 4322, with ten 100 ohm resistors. The 100:1 ratio transfer accuracy of this standard has been calculated to be better than 0.01 ppm. Each device contains ten nominally equal resistors permanently connected in series. A commutator connects the ten resistors in parallel, giving 1/100th the series resistance. Two optional commutators are available: One for a 1/10th ratio, and one for a 1/4th ratio. The internal resistors are wound from specially selected wire to provide matched temperature and power coefficients. The housing is hermetically sealed, providing isolation from changes in barometric pressure and relative humidity. Each 4321 10 ohm Hamon is provided with a matched parallel commutator. All models are supplied with ISO 17025 accredited, NIST traceable calibration data, including temperature characterization. High resistance Hamon transfer standards are available in a guarded construction.